The ultimate lurex party sock, the Selina sparkly black sock with yellow chevron stripe. 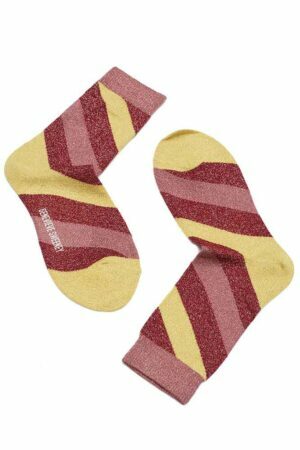 The traditional intarsia sock has been given a modern update with a chevron stripe that challenges a true hand intarsia sock machine, embracing traditional manufacturing with an innovative twist. A premium blend of cotton viscose with a striking lurex, the Selina Chevron sock combines luxuriously shimmering black and charcoal silver with a vivid bright yellow stripe in a shorter sock length.